The battle between alcohol and cannabis has seemed to wage on forever – but in truth, there’s really no contest at all. We live in a world where alcohol is legal, and cannabis, in large, is not. Why that is, I couldn’t tell you. I’m not a casual smoker, nor do I have any bias towards one or the other—but I am someone who looks at stats, and someone with enough wit and logic to draw a pretty simple conclusion out of this mess. Alcohol has nothing over cannabis, and that’s a fact. Alcohol is an addictive and health-damaging substance. There is a wealth of science and data to support that claim. However, cannabis is far less addictive—and is even used as a healing substance. 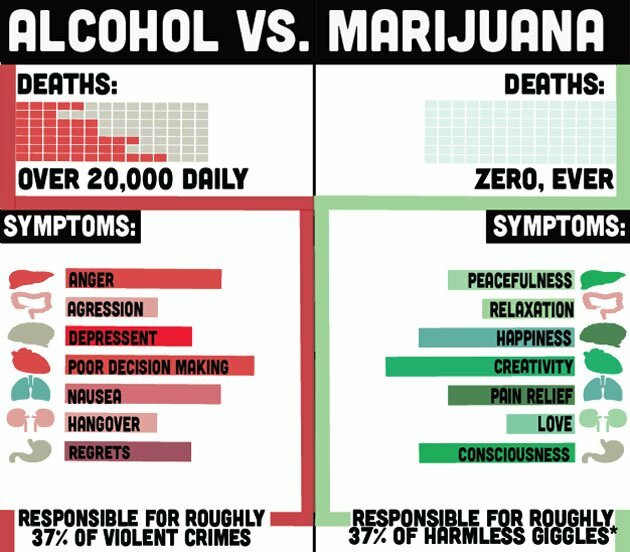 Alcohol is a depressant, while cannabis is an anti-depressant. Alcohol causes many different types of cancers—and while different ways of ingesting cannabis may have soft links to cancer, the plant itself is literally used to fight against cancer. Alcohol costs billions upon billions to produce and creates tons of waste due to packaging and cans. Cannabis has shown to cost a fraction of what alcohol costs to produce and maintain—and it has very little negative impact on the environment. Alcohol causes hangovers, physical fatigue, vomiting and nausea, as well as over a million annual deaths. Cannabis has never been the direct cause of death, an “overdose” is physically impossible, cannabis repairs and heals body cells, and it helps promote restful sleep. Some of you who are reading this may think that it’s a bit odd that cannabis is illegal and alcohol is legal, right. When looking at it this way, it’s kind of hard not to ask that question. You can even add the fact that states with legalized use of cannabis see lower crime rates after legalization to this list. How can we go back in time and to make alcohol illegal and cannabis legal? What kind of world would we be living in today? We may never know, but until more states start to legalize, keep these facts in the back of your pocket. You might just need them. You make some good points. However, the smell of marijuana is over-bearing. If the smell can be reduced and it still have medicinal benefits, that would be much more tolerable to society, as a whole. Luckily in states like Alaska, Washington, Colorado, Oregon and California where they have legalized it, the edible and drinkable cannabis is thriving, and which will most likely be the future. The most dangerous thing about cannabis is the police. Just ask my friend Nate Norman! Or my brother, or me, or etc... I am sure the majority of people in jail and prison for it would agree. The only victims of death from cannabis are the ones that were killed by police. I do smoke but very rarely, It does help me when I can't sleep!